»Culture & Arts»Pride Idol! Galway Pride Fundraiser – July 20th! Pride Idol! Galway Pride Fundraiser – July 20th! Calling all X Factor wannabes! Pride Idol comes to Galway, and kicks off on Thursday, 20th July, in Nova at 9pm! Singers will battle it out to win a place in the finale on August 3rd, with the final winner getting a cash prize, plus a slot on the main stage at the Galway Pride street party, in association with Nova. Celebrity judges will give their opinion on each act, but it’s the public who’ll choose the winner, by voting for their favourite act, and the top three going through to final. All the proceeds will go towards this year’s Galway Pride, which promises to be a vibrant event! The committee have put together a week of events that’ll kick off on August 7th, with a flag-raising in Eyre Square, Galway, at 1.30pm. said Rob Partridge, the current chairperson. 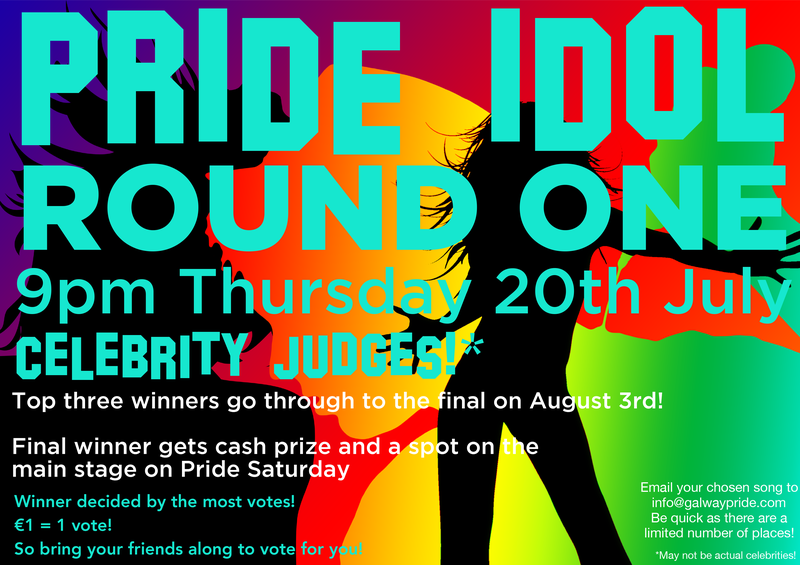 Pride Idol contestants will take to the stage from 9pm on Thursday 20th July for Round One. Round Two will be take place on 27th July, where a new set of contestants will again sing for survival and a spot in the final on August 3rd. If you’d like to enter, email your backing track to info@galwaypride.com, or bring it along on a CD on the night. If you’ve any questions, get in touch with them via email, or on their Facebook page. Come along, encourage the acts, vote for your favourite, enjoy the entrainment and support Galway Pride all at the same time! ← Out Now! EILE Magazine July 2017 Edition – FREE to read or download!